Been here before? Know the deal? Jump to the revision history to see what’s in the latest update. … or go straight to the Downloads. The name’s a bit of a mouthful, but “Convert-RibbonSbcConfigToWord.ps1” takes the backup file from your Ribbon/Sonus SBC/UX 1000 or 2000 gateway and creates a new Word document, with all of the important(?) 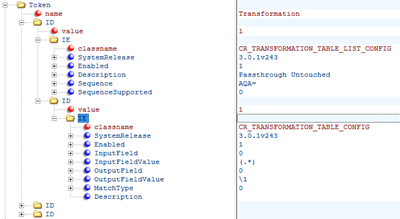 configuration information captured in tables. It started life as a way to save the tedium of screen-scraping lots of fixed frames for my as-built documents, but it quickly became apparent that it would also make a useful tool for the offline review of a gateway’s config (although it ain’t no “UxBuilder”). There are MANY hash tables throughout. (This is where an integer is stored in the config file, but it’s decoded to text on-screen). I’ve put a lot of effort into capturing these, but there are going to be examples where I’ve missed one. Please send me screen-grabs and sample config files and I’ll update the script. PS H:\> Convert-RibbonSbcConfigToWord.ps1 -InputFile "symphonyconfig.xml" -OutputFile "CustomerSBC-config.docx"
If the script won’t start, odds are you’ve run foul of a protective mechanism: the “Execution Policy”. Here’s how to Get the current value and Set it to “AllSigned”. The execution policy helps protect you from scripts that you do not trust. Changing the execution policy might expose you to the security risks described in the about_Execution_Policies help topic at http://go.microsoft.com/fwlink/?LinkID=135170. Do you want to change the execution policy? Do you want to run software from this untrusted publisher? File H:\\Convert-RibbonSbcConfigToWord.ps1 is published by CN=Greig Sheridan, O=Greig Sheridan, L=Petersham North, S=New South Wales, C=AU and is not trusted on your system. Only run scripts from trusted publishers. Convert-RibbonSbcConfigToWord.ps1 : The term 'Convert-RibbonSbcConfigToWord.ps1' is not recognized as the name of a cmdlet, function, script file, or operable program. Check the spelling of the name, or if a path was included, verify that the path is correct and try again. Suggestion [3,General]: The command Convert-RibbonSbcConfigToWord.ps1 was not found, but does exist in the current location. 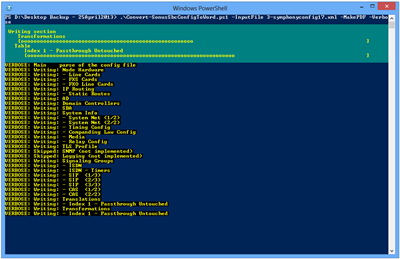 Windows PowerShell does not load commands from the current location by default. If you trust this command, instead type ".\Convert-RibbonSbcConfigToWord.ps1". See "get-help about_Command_Precedence" for more details. Some users have reported problems when running the script from a PowerShell ISE window. If that’s you, try it in a normal (but elevated) PowerShell window. At almost over 5,000 more than 5,000 7,000 8,000 10,000 lines of code this script’s not compact, but structurally it is really quite simple. There are two primary components: one that reads the XML and extracts the required values; and the second is a pair of very similar functions (“WriteSection” & “WriteSectionVertically”) that creates a suitable table and dumps the values therein. The main body of the script simply wends its way sequentially through the XML file, plucking out all of the sections of interest with essentially the same string manipulation repeating over and over again. (I had a go at it, but the unique content of each section prevented me from proceduralising this). As each section is read, the required parameters are extracted & formatted into an array. If there are multiple objects of the same type, these are also processed and an array of arrays is prepared in readiness for Word. 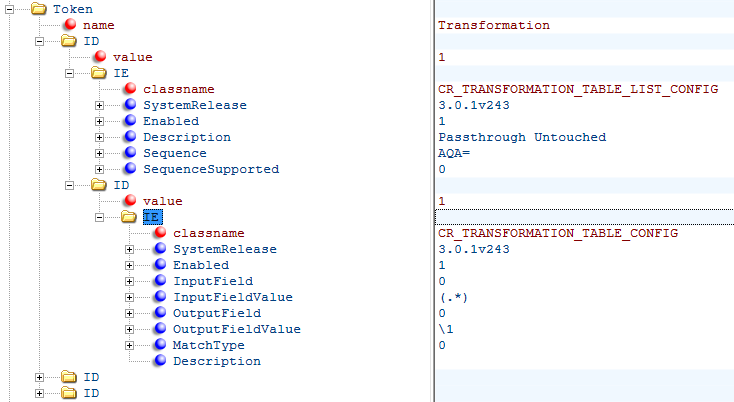 If the section has a “Sequence” value (the ordering of entries in a Transformation Table is a prime example), this is decoded and the array entries re-ordered to represent the active sequence. Once the sequence is correct, the final array is passed to the appropriate WriteSection. The WriteSection functions open and inspect the passed array, decoding it back into multiple constituent arrays representing column titles (“horizontal” tables only) and each table’s row. The title of the section is written to the document in the Heading1 style. If there are sub-headings (sub-tables or groups within the section), these are written as Heading2 and Heading3. We then loop through the array, writing each string therein as a new row. The ENTIRE revision history is now in a separate post here. Updated Strip-TrailingCR to keep removing the last char from the string until the last char ISN’T a CR. (Was only stripping once). close Word out from under you! If you have any problems downloading the latest version here you’ll also find it on the TechNet Gallery site. PLEASE let me know if you encounter any problems. All I ask is a copy of the symphonyconfig.xml file (de-identified as you wish) – or preferably a .TAR backup file – and a screen-grab from the browser to show me what it’s meant to look like on-screen. 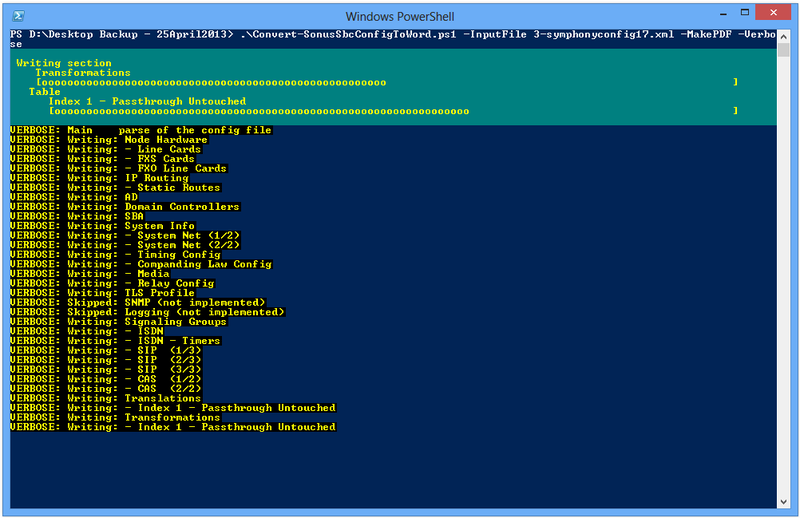 There are many great posts out there where people have achieved awesome things with PowerShell and Word, and I’ve relied heavily on their experiences and generosity. I’ve pasted these links into the bottom of the script as well. Cool stuff. Would be even cooler if the formatting matched Chris Cook’s awesome Lync Environment Report document (http://gallery.technet.microsoft.com/Lync-Environment-Report-cbc6fb1a). I think I love you ;-) Seriously awesome stuff mate! Nice Work Great Sheridan !! ( No… I didn’t misspell you name you are indeed great ). You make life easy for the Sonus Community. Hi Greig, tested today on a SBC1000SBA backup with Word in Italian, everything ok! Really nice job! I just change the script a little bit because I need a different color for the first row of tables. It would have been nicer if you choose only one variable for all the first rows but it was still easy to modify. And I replace variable after “.BackgroundPatternColor” by $wdColorFirstRow, to allow change the color in just one place. Many thanks for your script!!! Thanks Sophie! I’m glad you enjoy the script and I appreciate you sharing your contribution. I’m adding to v6.0 the ability to set the highlight and background colours as command-line attributes, borrowing some of your code! Greig, do you have any issue with me potentially porting this to Audiocodes? You mean other than I think you’d be mad to try? It’s a serious poisoned chalice James!! Go for it! Have you tried Chris’ doco script and decided you want Word/PDF over Excel? How do I keep missing all these cool scripts. Aborted with fatal error: You cannot call a method on a null-valued expression. If you can send me the backup file I’d love to see why it’s crashing. If you’re concerned for the privacy of the data, I only need the XML, and you can obfuscate the IPs, hostnames & any other identifying details before sending it through.